The key to designing an ideal environment for reptiles is to research their habitat in the wild then reproduce it as closely as possible inside the home you create for your pet. The natural needs of your pet should be taken into consideration when you are deciding what kind of cage your reptile will be housed in. If your reptile is aquatic or semi-aquatic, you’ll need an aquarium with enough room for either a basking area or a divider and a dry land section. Ground dwellers will need a long, wide cage to give a lot of area to roam around, while agile climbers need a tall, narrower cage to allow room for branches to scale and hang out on. When buying a cage, remember that you’ll also have to make room for food and water dishes, cage décor, a nesting box, etc. So go for the biggest cage you can possibly afford and have room for in your home, it’s the largest major expense for your pet but makes such a difference in their lives. And after all, a happy herp with enough space is far more interesting to have in your home than one in an uncomfortable environment. If you use full spectrum lighting, it helps with calcium and phosphorous, essential for bone health and also allows your pet to synthesise vitamin D. For reptiles used to the desert sun, full spectrum lighting is very important. Be cautious about where you place any lights, though, as the cold blooded reptile will burn itself and get heatstroke if given half the chance. Strange as it may seem, reptiles have little awareness of when hot is too hot, so any heat source you place within the cage must not have direct contact with your reptile’s skin. 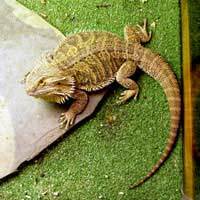 Substrates are what form the floor of your reptile’s terrarium. Look for substrate that is suitable to your pet’s natural environment, is easy to clean and won't be swallowed, causing impactions and health problems. What sort of environment you create for your pet will depend on what your reptile seeks out in the wild. Agile reptiles like to be able to climb and survey, so branches are excellent additions, while other herps appreciate a good basking rock or hollow log to burrow into. Reptiles are often rather private creatures and like to hide out so a box for resting and hiding in, plants, logs, and other items your pet can camouflage in, get inside or burrow under give a feeling of security. Always sterilise any new additions to the décor before adding them to your pet’s environment. Rocks need to be cleaned and boiled for about half an hour, branches should be rinsed off and baked at 250 F in the oven for half an hour to kill pests, fungus and harmful bacteria. Water is crucial to the health of your pet but the needs of each species are very specific to their natural environment. Desert species require an occasional misting and a dry climate, while tropical reptiles need a humid atmosphere and often a swimming area as well. Swimming pools should be shallow for safety from drowning and kept clean of debris. Good airflow is important in any environment with heavy humidity as well. Become knowledgeable and work with the natural needs of your reptile and you’ll have a happy home for your herp.